I’m an Olympics junkie. I can’t get enough of it. The next two weeks will be a lot of fun. Let’s kick off the festivities with a look at the outfits worn by the Estonian and German Olympic teams seeing as I’m half Estonia and half German. I’m happy with what both countries were wearing. Just about all countries had two clothing options; one for men and one for women. Estonia did it differently. Each Estonian player had the option between three different colors for their tops. So we saw some Estonians wearing orange, some blue, and some yellow. The colors as a whole worked well together. It was a nice, vibrant, celebratory palette. The clothes were pretty basic which allowed the patternless colors to make the bold, refreshing statement without going overboard. 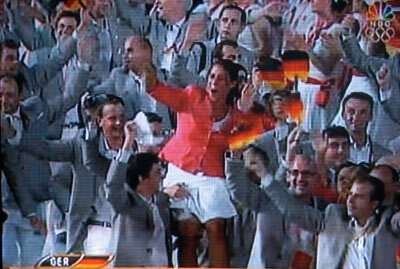 And the men wore white pants while the women had white skirts which again served as a nice base for the colorful tops. All had some sort of white fedora which looked cool on some of the athletes and dippy on others. 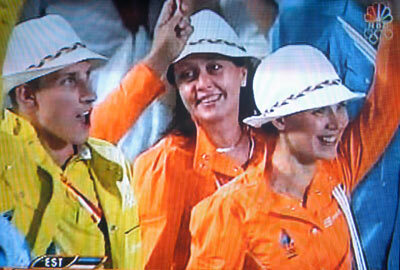 These hats were 10 times better than the stupid 1940s Italian gangster hats that the U.S. athletes were wearing. Ralph Lauren designed them and they looked stupid. They covered up the U.S. athletes’ eyes. Upon watching (and photographing) the replay of the Estonian Olympians, I noticed that the material might have been some sort of semi-reflective plastic-type, rain-slicker like material. slick. I Tivo’d the Opening Cermonies and haven’t watched the entire Parade of Nations yet, but from what I saw it was clear that the Germans were the most playful in their entrance. Men were carrying women on their shoulders. Others where jumping in front of the camera like school kids. This is such surprising activity from Germans of all people. But I love it. Have fun. It’s a time to celebrate. The German’s clothing selection is a better representation of what the world knows of Germany. The clothes were very simple and elegant. Gray blazers and trousers for the men. Red blouses and white skirts for the women. No stupid hats. No crazy ties. Just very efficient, but classy.